Home > Grief & Loss > What is Traumatic Loss? It is not uncommon to be deeply troubled when we experience the death of others to suicide, violence, industrial accidents, car crashes, natural disasters, terrorism, war and other dramatic, unexpected forms of death. The suddenness, and perhaps the horror or frightening nature, of the manner of death can often leave us feeling as if our lives have been turned upside down completely. In addition to more common experiences of grief, we may be plagued by memories or imaginations of what the deceased person’s experience of death was like. We may fall into shock, numbness, fear and ultimately, a crisis of meaning. Profound disbelief: The person died in a sudden, unexpected manner, and you are struggling to wrap your mind around it. It may help to revisit the scene of the death, to see where it occurred and get a better sense of what happened. Attending a funeral, memorial service or other ritual can also be of help, by bringing together people who collectively recognize and mourn the loss. Persistent recollection: In the vein of something that “gets stuck in your head,” people who suffer traumatic loss are often revisited by imagery, whether real (as with eye-witnesses or television broadcast) or imagined (hearing about the trauma and envisioning it). These recollections can come in the form of memories, dreams or nightmares, morbid fantasies, photographs or video recordings. It is common to want to avoid such recollections, and while for most people the imagery tends to dissipate over time, for others, it becomes persistent and dreadful. People may go to extreme lengths to avoid having these images emerge, such as refusing to talk about the loss, not wanting to leave their homes, busying themselves with excessive activities or turning to drugs and alcohol to dampen mental and emotional activity. Left untreated, this sort of response can turn into an anxiety disorder such as Post Traumatic Stress Disorder (PTSD). In grief, mourners often experience a “loss of meaning,” some way in which the order of the world is disrupted and must be mended again. This commonly occurs because we have, consciously or unconsciously, held an important “meaning” story related to that which we’ve lost, be it a person, a job or perhaps cherished items stolen from us by a house fire or theft. We feel the sudden void left by this vanishing, and a sense of meaninglessness can ensue. When it comes to traumatic loss, the crisis of meaning can be profound. Trauma is identified as a special circumstance precisely because of its ability to undermine meaning, destroy one’s sense of “self” and cause entire belief systems to collapse. Philosophers, psychologists and other “thinkers” aside, most of us don’t spend too much time identifying and evaluating the myriad assumptions and beliefs we hold that describe our view of “how the world is supposed to be.” We operate in a universe to which we have, usually largely unconsciously, ascribed a set of rules and orders. This crisis may be understood as a significant challenge: To resolve it poorly can result in chronic, persistent feelings of depression or anxiety; to resolve it effectively means to come to acceptance of life’s unpredictability and learn to embrace the present moment, perhaps even allowing one to cherish life and relationships more than ever. Although most of us have the innate ability to pass through grief and heal from loss, a crisis of meaning is one that often requires some help from others to successfully overcome. Counselors, pastors, spiritual mentors and thoughtful philosophical friends may all be of help in this situation. Many communities have support groups for people who have suffered loss from suicide or murder. Similarly, in the wake of natural or man-made disasters, many resources may be available in your community to deal with this, and a local chapter of the American Red Cross is often a good place to learn what’s available. Otherwise, seek a counselor who is skilled in the treatment of traumatic bereavement, which is a nuanced form of therapy that often falls beyond the bounds of both traditional grief counseling and traditional trauma therapies. 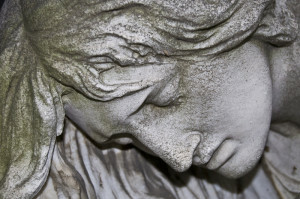 In Oregon, listings of support groups for those grieving deaths by suicide can be found here. For children and families dealing with traumatic bereavement, The Dougy Center has an excellent reputation. Grief & loss therapy groups in Portland can often be found among the up-to-date group therapy listings maintained by Portland Therapy Center.